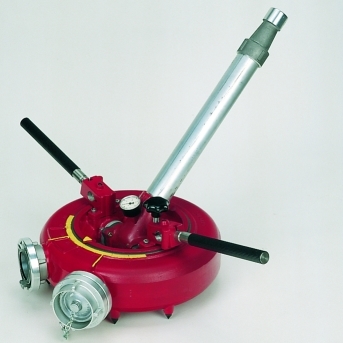 Up to 4000 l/min., applicable with water and foam. Suitable for mounting on flanges to DIN 2633. Swivelling range horizontal 360 degrees infinitely variable and vertical from -70 degrees up to +90 degrees. Horizontal and vertical adjustment by hand wheels. Self-arresting gearing units lock the monitor in each position. 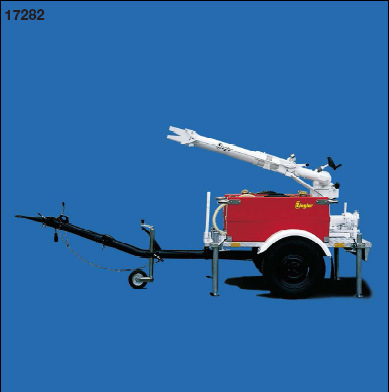 Up to 2000 l/min., useable for water and foam. 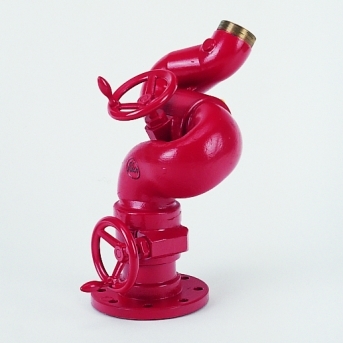 Suitable to be mounted on flanges DIN 2633. Swivelling range horizontal 360 degrees infinitely variable and vertical from -45 degrees up to 70 degrees. Both directions can be locked by starshaped grip. Stepless fixable handlever. Up to 1600 l/min., suitable for water and foam. 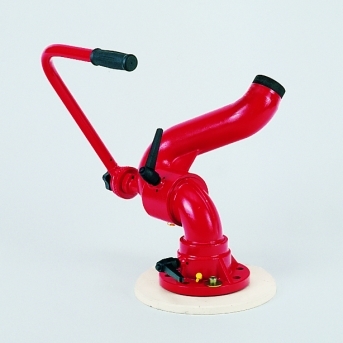 Portable monitor for mobile use and the opportunity to mount hollow or sprayjet nozzles. Self locking vertical adjustment arrests the unit in any position. Built-in locking device at +30 degrees. Swivelling range vertical from 0 degrees up to +60 degrees. Horizontal movement alternatively with handlever or oscillating unit. Swivelling range horizontal +/-135 degrees (manually operated) and +/-30 degrees (with oscillating unit). Stepless adjustable break prevents the monitor from unintended swivel. Top and bottom part of the monitor can be separated by a bayonet locking. The monitors top part can be installed to a flange (available as accessory). Foldable feet to save space. Pressure gauge filled with glycerine, in series. Up to 1400 l/min., suitable for water and foam. Compact and handy appliances without additional supports. 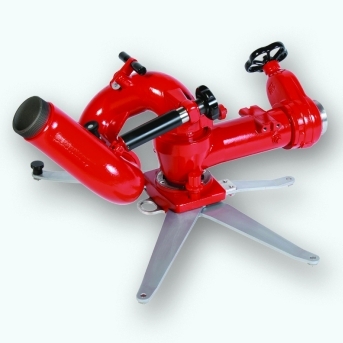 Swivel range: horizontal 360 degrees, vertical +30 degrees to +90 degrees. Version with gauge: vertical +30 degrees to +90 degrees. Two plug-in handles are used for slewing the internal bearing housing.